Welcome 2018 with 3 traditional Ayurvedic Rituals. In about a week, the world will bid adieu to a year that caused us much grief and growth. Here is how I am planning to prepare myself and my home to welcome a soul satisfying 2018. It is a sad home that does not get spruced up for New Year in India. Whether it is a Maharani’s palace or a humble hovel in a sprawling city, cleaning is a big part of the end of the year winding downs. Shuchitwam or Saucha, is so valued, its part of the five niyamas or observancesof Yoga. When I am traveling through India, I always notice great activity everywhere. Of clothes lines heavy with washed draperies, kitchens and homes getting a good water scrubbing and women bringing their assorted gleaming storage pots and pans out in the sun to dry. 15 minutes a day works for all of us who are time-challenged. Set the timer and go! I keep what makes me happy, what has served me well and what I value. What I have not used in a year or have no use for, I add to my donation box, starting my New Year with charity, a very important Vedic practice. What I give away, I give away with love and blessings to the one who will find use for it. Start with your closet, if you are unsure. Simply do what you can do for 15 minutes a day even if you have your home professionally cleaned. This is an act of love towards your home and your home will reflect this love back to you. On New Year’s morning, after my puja or prayer rituals, I create a simple geometrical mandala at my door step. It does not have to be complicated. 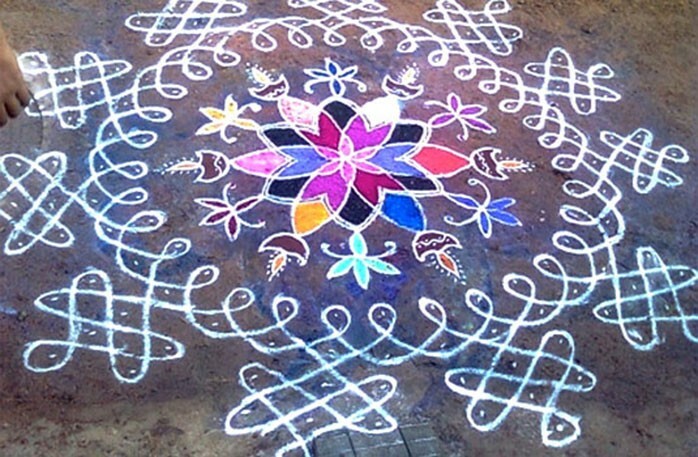 YouTube has a ton of simple floral or geometric pattern rangoli or muggulu designs, as we call it back home. I use rice flour, which the ants can eat, again starting my New Year with an act of kindness to other beings. I pluck some flowers and leaves from my garden and add to the mandala. I love to make infinity loop mandalas as a meditation. The idea is to trap the energies that are unwanted, it is almost a ‘tricked ya!’. A Mandala is my way of getting myself in the zone for intention setting and inviting only beneficial energies into my home. Watching the sunrise with my loved ones on New Year’s morning is a very satisfying ritual for me. The best New Year I have ever had was time spent in Hampi, India, with my family, walking through ancient cobbled stone pathways covered with mandala designs, washing our hands and feet in the Thungabhadra river and offering prayers at the temple at the crack of dawn. I still remember the joy I felt at feeding the cows and goats fresh leaves and bananas after the prayers. 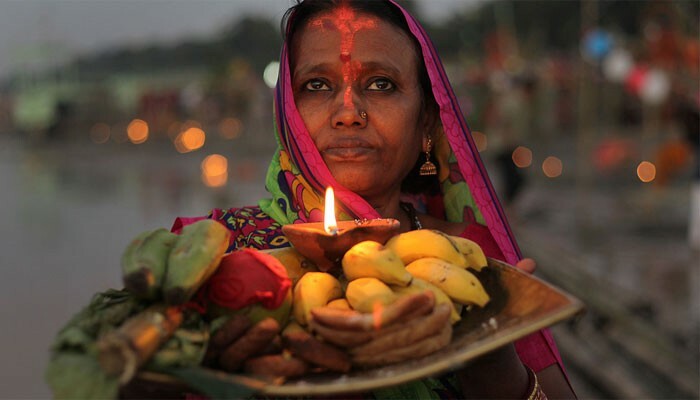 Remembering the Divine, showing gratitude for our ancestors and offering love to the animals who serve us in so many ways, before focusing on our needs, is a Vedic way of living. The Divine will receive any offerings of our devotion, be it a palmful of water, a leaf, a flower, a lamp, a thought, a hope, a wish. All is welcome. Create an altar at your bedside before you head out for the New Year’s party. Offer a sunrise prayer from your bedroom when you wake up. This New Year we are doubly blessed with a full wolf moon on January 1, 2018. I am especially looking forward to an evening of fire ceremony, sacred intention setting and meditating in the moonlight for at least 15 minutes. Send out a Facebook invite, gather your friends, make a big bowl of warming soup, do a fire ceremony and journal your revelations and intentions after the moon gazing. For the past five years, my New Year ritual has been to ask the Divine to find greater use for me. Every year I have been called to serve ever greater numbers with ever more influence since then. I bless you with the same.